The Best Customer Experience Your Brand Has Ever Seen! 1. Coaching, Feedback, and Accountability. In this area I want to give you the tools and plans that will build your confidence and skill in coaching your team to optimal performance, by addressing unacceptable performance and by holding employees accountable. 2. Friendliness, Empathy and Connection. I want to give you the tools and methods to position your employees to deliver a welcoming, warm and refreshing customer experience. So, how exactly will these goals be met? You have access to Myra’s webinars for as long as you’re a member. New webinars announced via email to remind you to login and get your professional development and inspiration. Enrollment for up to 10 people in Myra’s Customer Service eLearning suite, so you can give your employees Myra’s very best training at their own pace. 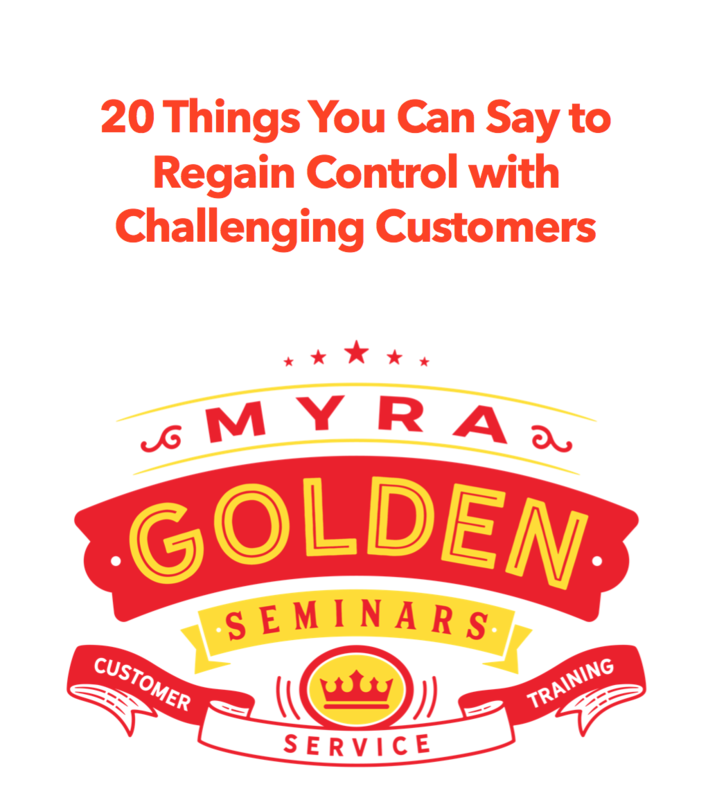 Access to all of Myra’s training course scripts, exercises and slide decks, so you can train your own employees using Myra’s proven methods. Here’s a short video overview of the Customer Service eLearning Suite, which is part of Full Access. Learn more about the eLearning that you’ll get with Full Access. Take a look at our live and archived webinars, also a part of your Full Access Pass. Licensure is $1,500 per year and includes up to 10 unique logins. Please keep in mind that an unlimited number of people can access the course with a single login. Additional logins can be purchased in blocks of 25. Please call our office for details. Previous Previous post: I Left Post-It Notes of Praise On Each of My Employees’ Computers. Here’s What Happened Next. Next Next post: I Ordered Groceries Through Walmart’s Online Ordering. Here’s How it Went.